FRAMINGHAM, Mass. 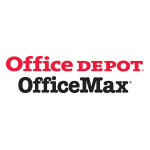 & BOCA RATON, Fla.
On Monday, Staples and Office Depot begin our hearing in U.S District Court as we fight to merge the two companies. Our commitment to this merger has not changed. The transaction is good for customers of all sizes. The combined company will be positioned to better serve the changing needs of business customers and compete more effectively against a large and diverse set of competitors. The FTC’s actions to stop this transaction are based on a flawed analysis of the marketplace and a deep misunderstanding of the competitive landscape. The FTC has cherry picked a few facts to fit its narrative and support its case. In making its case, the FTC refuses to even acknowledge the rise of new competitors, such as Amazon, and the disruptive effects of the digital economy. The government is concerned with protecting the 100 largest companies in the United States, arguing that the transaction would lead to the largest, most powerful companies in the world paying higher prices for pens, pencils, notepads, sticky notes, file folders, paperclips and copy paper. In fact, Staples has committed, again and again, to investing merger synergies in lower prices for all customers. Based on the FTC’s own view of the market more than 99 percent of our commercial customers will be, at worst, unaffected by the merger. In reality, these customers and all others will benefit directly from the merger’s cost savings and resulting lower prices. Still, the FTC continues to act against the best interests of the hundreds of thousands of business customers, and millions of everyday consumers who will benefit from the acquisition. The FTC also ignores the millions of products beyond office supplies that customers purchase, everything from cleaning supplies to breakroom snacks to furniture and technology. The acquisition has been approved in Australia, New Zealand, China and the European Union, subject to a divesture. Many regulatory agencies around the world clearly understand that the acquisition will provide us with an unparalleled opportunity to increase value and service to customers of all sizes. 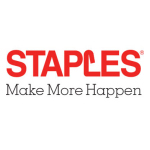 To try to meet the government’s requirements, Staples recently entered into an agreement with Essendant to divest more than $550 million of wholesale business subject to the successful completion of the merger. Approximately half of the revenue we plan to divest is from Fortune 500 companies and 25 percent of the revenue is from Fortune 100 companies. Staples also plans to divest assets that will make Essendant an even stronger competitor than it is today, with the ability to compete for all business customers, including national account business. The FTC is simply wrong. 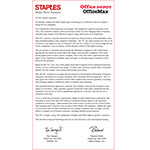 The combination of Staples and Office Depot is good for customers. This has been a long and frustrating road, but we look forward to a fair and impartial hearing. 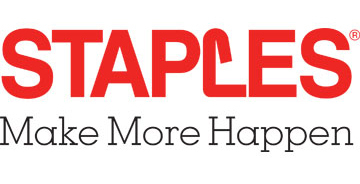 Staples issues an open letter to customers.